For Gigi, 80L was too big and 40L was too small for a backpack. Read her Osprey Aura 65 backpack review to see why she’s happy with this middle sized one. Flissy travels exclusively with her Aeronaut 45, a bag that gives her freedom as a frequent traveler. Her Tom Bihn Aeronaut 45 backpack review details why she loves the bag. Michelle challenged herself to pack less for her round the world trip, so she downsized to a smaller backpack. Read her osprey ozone 35l backpack review to see why she’s loving this bag. Always on the hunt for a better bag, Ali recently replaced her old daypack. Read what she thinks of her new bag in this Osprey Escapist 25 backpack review. Kathryn’s bag converts from 35L to 45L and backpack to shoulder bag. She shares the pros and cons in this Standard’s Carry-On Backpack review. Bag obsessed Svenja tested a new backpack for her US road trip and loved it. 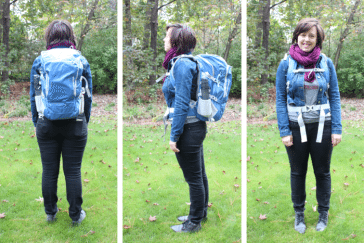 Her Tom Bihn Aeronaut 30 backpack review tells why it’s her new favorite bag! Do you struggle with a heavy backpack? Do you travel with tons of things you never use? These downsizing stories will inspire you to downsize your luggage and travel with less. The right bag can go a long way in protecting your belongings. PacSafe anti theft travel bags are one of the most popular options to stop thieves. One of the biggest decisions when buying a backpack is front loading vs top loading. Here are some important factors when choosing a front loading backpack. Caroline has tried out a lot of great female travel backpacks, but recently she tried the Outdoor Products Artemis backpack and it’s her favorite one yet. Not all backpacks are created equal- or work for every body type. That’s why Tam compiled the ultimate rundown of best backpacks for slim and petite women. Lucy has traveled for 8 months with her latest backpack. See why she loves her small, top-loading backpack in her Karrimor Trail 35 backpack Review.